You would think that after almost a year of baking with Heavenly Cake bakers I would be prepared for any issues that baking and frosting a cake can throw at me. I was wrong; because the baking gods continue to keep me humble by once in a while just hurling a tiny-itsy bitty curve ball that will explode into a curse fest in my kitchen. 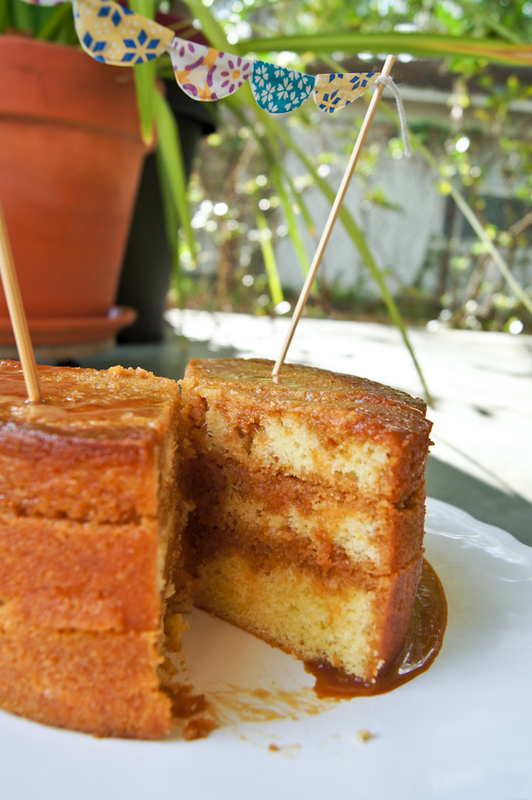 It all started when I took a peek at last month’s issue of Saveur magazine and saw they were featuring southern cakes. Oh my heart did a happy dance when I opened my mailbox and totally skipped everything to read the article and see the pretty cake pictures. I’m a huge fan of homemade cakes;the ones that are passed down from generation to generation. Yes, I do appreciate the fancy cakes. But, the homemade ones hold my heart. So when I hosted a “Chica Brunch” at my house a couple of weeks ago, and one of the guests was celebrating her birthday, I decided to surprise her with a small cake. Since I knew she had the same love affair with caramel as me, there really was no choice but to make the cake in the article. The cake batter gave me no issues. It was actually very simple to make and cutting the recipe ingredients in half to make a smaller cake did not affect the end product at all. I ended up with a beautifully golden yellow cake. Next up was the Caramel Fudge Icing and here is where my entire baking experiences left me high and dry. The recipe could not have been more no-nonsense (sort of like a southern belle) - You basically heat all of the ingredients in a saucepan until a candy thermometer reads 232°, which is about - more or less - 40 minutes of stirring over the stove. FORTY MINUTES! - I suggest you take a bathroom break before you start on this icing. Mine took about 45 minutes of stirring, and during all this time I kept thinking, “this is not right, this is not right, it should be thick by now” - but, I did what I was told and waited for that candy thermometer to hit the 232 mark. Once it does, prepare yourself for a scientific moment. You need to add the baking soda at this point, along with some vanilla extract - and here I give you my second tip for this icing. Make sure you use a BIG saucepan, because once you add that teaspoon of baking soda, that mixture will come up the side of the pan and bubble up like there is no tomorrow. Trust me; you do not want to be the crazy person running around the kitchen cursing up a storm, because you know that you are going to have spilled sticky caramel all over the counter top. So, I finished running around, poured the caramel sauce into a bigger bowl, turned the mixer on it and beat for one minute looking for it to turn into the consistency of pudding. 1 minute - zip. No pudding-like consistency. Still a sauce. A very good sauce, the kind that you can pour over vanilla ice cream, but not cake. What happened? I have no clue. I followed the recipe to the letter. And after reading it for the 50th time, I gave up and called it a wash - I just could not find the moment where everything went wrong. 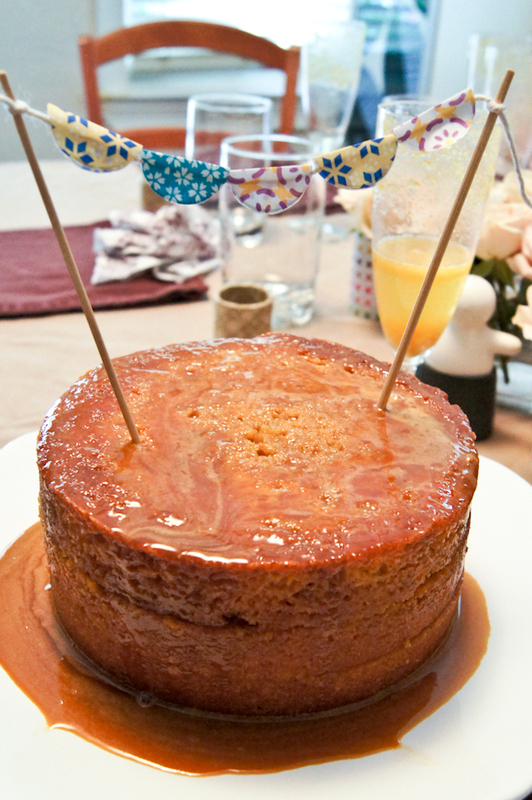 I gave up and poured the “sauce” over the cake and held my breath every time the cake layers shifted. Since I made this cake the day before, I was in total panic that it was going to collapse until I placed it in front of the birthday girl and told her to cut it. But, even if the whole thing would have fallen apart (it did not) the cake was so good that everything would have been forgiven. The star of the whole thing? The no-so-pudding like caramel sauce. It was classic smooth, creamy and oh so succulent, that I was glad we had plenty of left over. During the weeks that followed we ate that stuff with ice cream, over bread, wafer cookies dipped in it and of course, plain with a spoon. Tom has demanded that I make more to have on reserve. I’m praying to the baking gods to strike me with everything they got so I can duplicate the sucker. Finger are crossed, since there will be a repeat. In the meantime you can give it a try and find the recipe over at Saveur. And let me know if your frosting sauce works!